Pimento cheese has been a staple food down south for generations, and now it's becoming ubiquitous in other parts of the country. At least that's the way it seems to me, a Marylander. My state is technically south of the Mason-Dixon Line, but up here in Baltimore we are definitely not the South. Still, I see pimento cheese popping up on menus everywhere around town, put to use as a burger topping and even as an accompaniment for the unusual (but tasty) combination of fried oysters and waffles. And why not? It's delicious, and if you have the right ingredients on hand, simple to make. 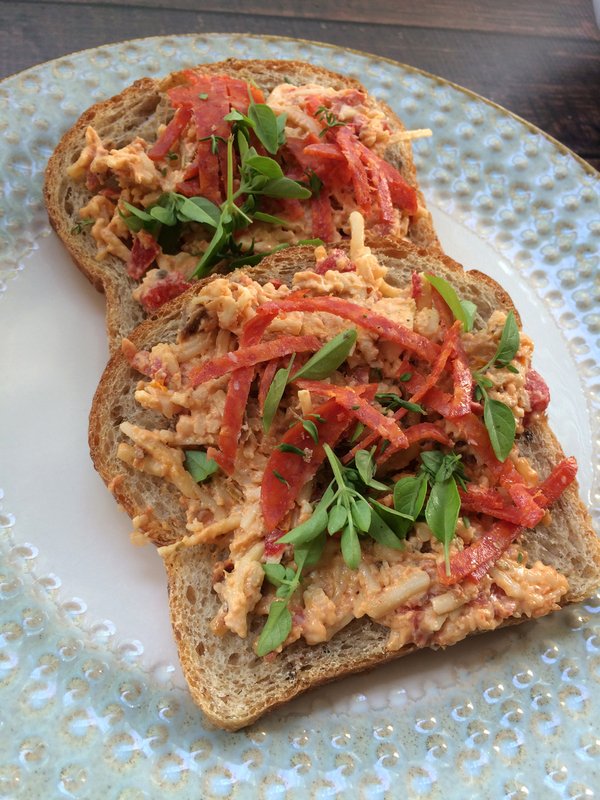 While there is both cheese and pimentos (or roasted red peppers) in pimento cheese, mayonnaise is possibly the most important ingredient. Without it, it's difficult to get the cheese to spread. Duke's is the mayo to use, if you can find it, otherwise, use your favorite. Other than that, pimento cheese requires seasonings, which can be as simple as salt and pepper and a dash of hot sauce, or a bit more complicated with the addition of garlic and onion powders, maybe a bit of Worcestershire sauce. Chef Richard Blais' recipe strays from the South to the Southwest, with the addition of cilantro and poblano peppers. I bastardized the concept quite a bit when I added feta and harissa paste to make a Mediterranean-style pimento cheese, and now I'm going to do it again with my latest cheesy invention: Pizza Pimento Cheese. Seemed like a no-brainer: add sundried tomatoes and pizza herbs, swap out the cheddar for mozzarella. Add pepperoni, too, because why not? and garnish with fresh basil and thyme. 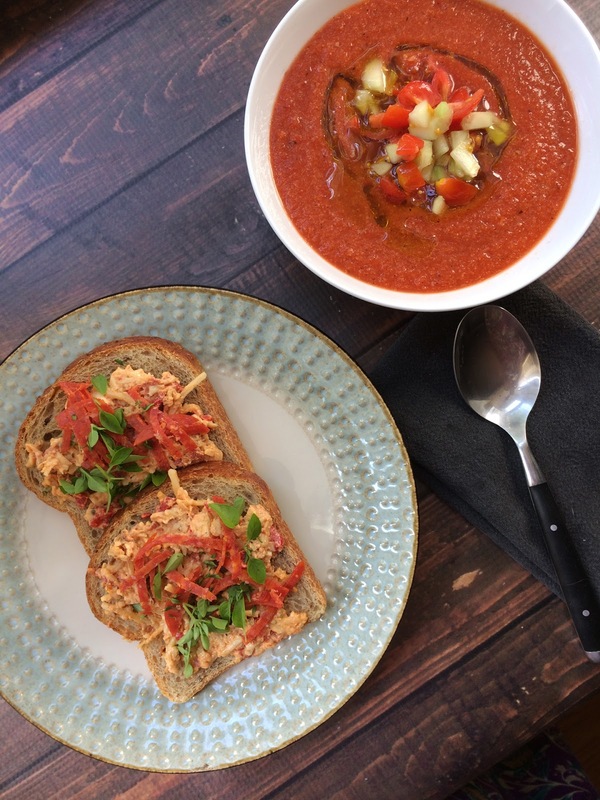 Toasts topped with this concoction made a perfect alternative to a hot grilled cheese sandwich when eaten with a bowl of chilled gazpacho on a hot summer day. And it tasted like pizza. What's not to like? Rehydrate the tomatoes by soaking them in boiling water until soft, about 15 minutes. Drain well and chop finely. Set aside. Combine the cream cheese and mayo in a large bowl. Add the cheeses, pimento, pepperoni, and seasonings and stir well to combine. Alternately, you can pulse it a few times with a food processor. Stir in the chopped sundried tomato. Taste for seasonings and add more oregano or garlic if you feel it needs it. Spread on lightly toasted bread. Top with fresh basil and thyme. You could also add more pepperoni, if you want. Tastes even better after a day or two in the fridge.